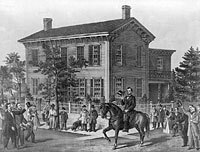 When a delegation from the 1860 Republican National Convention arrived in Springfield, neighbors of Mr. Lincoln offered to provide liquor to serve the distinguished guests. “Gentlemen, I thank you for your kind intentions, but must respectfully decline your offer. I have no liquors in my house, and have never been in the habit of entertaining my friends in that way. I cannot permit my friends to do for me what I will not myself do. I shall provide cold water – nothing else.”1 Not even the presidency was worth compromising his principles. This attention to truth and detail was hardly a development of Mr. Lincoln’s old age. Harvey Lee Ross met Mr. Lincoln when he lived in New Salem. One day, Ross went to Samuel Hill’s store where Mr. Lincoln clerked and asked whether they had gloves. Allen Thorndike Rice, editor, Reminiscences of Abraham Lincoln, p. 171. John Wesley Hill, Abraham Lincoln – Man of God, p. 189. 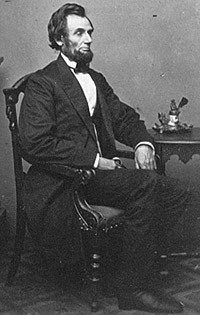 Roy P. Basler, editor, The Collected Works of Abraham Lincoln, Volume IV, p. 421-441. Ida M. Tarbell, The Life of Abraham Lincoln, Volume II, p. 287-288 (Roy P. Basler considered this letter to be a forgery). Douglas L. Wilson and Rodney O. Davis, editor, Herndon’s Informants, p. 541 (Letter of Jason Duncan to William H. Herndon, late 1866-early 1867). William Lee Miller, Lincoln’s Virtues, p. 273-274. William Lee Miller, Lincoln’s Virtues, p. 274. Roy P. Basler, editor, The Collected Works of Abraham Lincoln, Volume II, p. 461-469 (June 16, 1858). Roy P. Basler, editor, The Collected Works of Abraham Lincoln, Volume VI, p. 487 (Reply to Sons of Temperance, September 29, 1863). Michael Burlingame and John R. Turner Ettlinger, editor, Inside Lincoln’s White House: The Complete Civil War Diary of John Hay, p. 89 (September 29, 1863). Roy P. Basler, editor, The Collected Works of Abraham Lincoln, Volume I, p. 347 (Letter to Williamson Durley, October 3, 1845). Douglas L. Wilson and Rodney O. Davis, editor, Herndon’s Informants, p. 165 (Leonard Swett’s letter to William H. Herndon, January 17, 1866). Douglas L. Wilson and Rodney O. Davis, editor, Herndon’s Informants, p. 499 (Letter from Joshua F. Speed to William H. Herndon, December 6, 1866). Justin G. Turner and Linda Levitt Turner, editor, Mary Todd Lincoln: Her Life and Letters, p. 180 (Letter from Mary Todd Lincoln to Abram Wakeman, September 23, 1864). 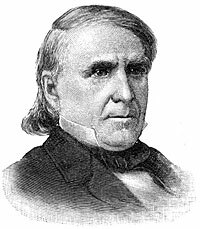 Rufus Rockwell Wilson, editor, Intimate Memories of Lincoln, p. 156 (Joseph Wilson Fifer, May 29, 1856). Roy P. Basler, editor, The Collected Works of Abraham Lincoln, Volume III, p. 145-201. Thomas F. Pendel, Thirty-Six Years in the White House, p. 20. Thomas F. Pendel, Thirty-Six Years in the White House, p. 25-26. Harvey Lee Ross, The Early Pioneers and Pioneer Events of the State of Illinois, p. 96. Roy P. Basler, editor, The Collected Works of Abraham Lincoln, Volume VIII, p. 131 (Letter to Nathaniel P. Banks, December 2, 1864).